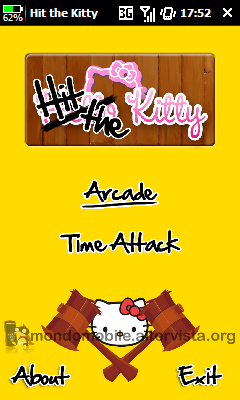 Hit the Kitty is a simple game for Windows Mobile. The latest Hello Kitty invasion on every shop window, rack, magazine page and what-have-you is making you want to bang your head against the wall? No need for that, now there's one more way of venting your pent-up irritation... Hit the Kitty. and needs .NET Compact Framework 3.5 in order to work. Now, let's go and see how the game works. On opening the app, you get to choose between two game modes - Arcade and Time Attack. In the first, you have to hit as many Hello Kitty as you can, out of a maximum number you can set yourself; in the second mode you've got to get them all before time runs out.